Telstra’s strengths in connectivity and secure data storage, combined with their vision to build an eHealth ecosystem, makes this an extremely exciting opportunity for us. 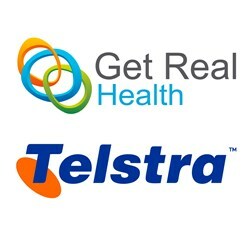 Get Real Health is proud to announce its new partnership with Telstra, Australia’s leading telecommunications and information services company, to serve the rapidly growing healthcare IT market in Australia. Telstra will be the exclusive reseller in Australia of Get Real Health’s award-winning InstantPHR™ patient engagement platform. Robin Wiener, Get Real Health’s President and Founding Partner, visited Sydney earlier in February to meet with Telstra Head of Health Shane Solomon and explore opportunities to deliver InstantPHR to Australian healthcare consumers and providers. InstantPHR will be integrated into Telstra’s existing technology environment and sold by the newly created health team at Telstra to healthcare and nonprofit organizations (NGOs) in Australia. The InstantPHR platform includes more than 200 care coordination, data visualization and patient self-management tools that can be used to quickly, easily and cost-effectively create and customize web and mobile personal health applications. Additionally, Get Real Health will provide marketing, sales, technical support and training to enable Telstra to install and configure InstantPHR for its clients. Telstra’s healthcare solutions will be focused on using technology to more effectively deliver health and aged care services in Australia. Shane Solomon, Telstra’s Head of Health, explained that Telstra established its new health business in early 2013 to deliver a comprehensive range of eHealth solutions. Part of this strategy involves the deployment of a proven personal health record that is able to meet the needs of multiple stakeholders. “Introducing Get Real Health’s world leading patient engagement platform to Australia brings many new opportunities. InstantPHR will be a key consumer interface for Telstra’s eHealth ecosystem including the ability to connect hospital EMRs and other clinical information systems used by local doctors and hospitals. It will also provide an important connection with health monitoring devices used by consumers in their homes,” said Solomon. Founded in 2001 and headquartered in Rockville, Maryland, Get Real Health is an award-winning global health information technology pioneer specializing in patient engagement and connected care solutions. Get Real Health’s flagship product — InstantPHR™ — is an electronic toolbox for creating and customizing personal health applications. In addition to the InstantPHR platform, Get Real Health offers turn-key solutions and custom services for a wide range of healthcare organizations. Get Real Health has a diverse global customer base and strategic partnerships with industry leaders including Microsoft, Caradigm, TELUS Health Solutions, LINK Development and Telstra. Telstra established its health business unit in early 2013, led by Shane Solomon, former National Partner for Healthcare at KPMG and Chief Executive of the Hong Kong Hospital Authority. Telstra’s aim is to combine the reach and trust of an iconic Australian brand with proven health industry expertise to deliver an integrated eHealth ecosystem.